Big, bold, and bodacious, the Consumer Electronics Show or CES, is the world’s largest annual tradeshow for consumer technology. CES brings endless opportunity for engagement and excitement. With more than 3,600 exhibitors across 2,000,000+ square feet of exhibit space vying for the attention of 170,000+ industry professionals from around the world, the competition is fierce. Let 2020 Exhibits help to drive down your total cost of exhibiting with our turnkey, bundled services and support, offering custom displays and trade show rentals for CES 2019. Located just a short distance from the Las Vegas Convention and World Trade Center, home to CES 2019, 2020 Exhibits’ seasoned team of exhibit and event experts can develop and deliver a successful event experience. 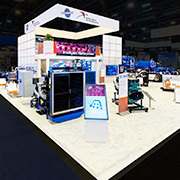 From total tradeshow marketing and event design and management including the design, fabrication and installation of award-winning custom CES tradeshow exhibits and displays for consumer electronics and consumer technology industry leaders worldwide. Offering the latest and greatest A/V and high-tech technologies 2020 Exhibits Las Vegas has the in-house resources to deliver your comprehensive CES 2019 exhibit and tradeshow program. From the show floor, your CES 2019 sales team can see and measure level of interest and true product focus for lead generation. Follow up can be immediate while utilizing 2020 Exhibits’ lead capture services, with the sales team no longer waiting for key analytics and information to make the call. CES is an experience you can’t afford to miss. Let 2020 Exhibits put our experience to work for you at CES 2019. 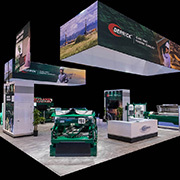 AWARD-WINNING CUSTOM EXHIBIT RENTALS FOR CES – In-house and around the corner. Go Big or Go Home. Offering the largest custom exhibit rental inventory nationwide, 2020 Exhibits delivers greater flexibility and lightens the bottom line. Award-winning creative & design! 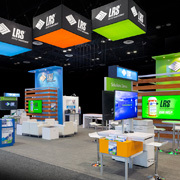 2020 Exhibits creates and designs custom environment exhibit rentals, including double deck and table top displays that make our clients dazzle the crowds. 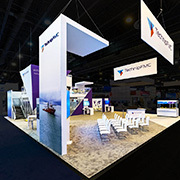 With the highest expectations, 2020 Exhibits specialize in custom inline displays, peninsula exhibits, tradeshow islands, and display portables. WORLD-CLASS EVENT MANAGEMENT – Increase bottom-line results with seamless collaboration and performance measurement. Revolutionize your CES 2019 event process, leveraging resources and boosting productivity to move your global organizations forward, faster with 2020 Exhibits Event Intelligence. Over 150,000 end users maximize our cloud-based Event Intelligence to drive real business results. Move your business ROI and results forward, faster, with Event Intelligence. EXPERT LOGISTICS & ON-SITE MANAGEMENT – Total show services including I & D, logistics management and more. A full range of pre-, during- and post-show services including general show services (yes, consider us your general contractor! ), along with freight and global logistics strategy and execution. Backed by powerful, real-time, analytics MEDIA SUITE, the most dynamic, all in one, easy- to-use interactive sales tool and engagement solution in the industry, is perfect for captivating and engaging CES 2019 attendees. Maximizing the power of dynamic lead capture and data, MEDIA SUITE’s customized survey technology captivates attendees and creates a more engaging, customized experience. NEED HELP PLANNING YOUR CES 2019 EVENT? Creative, smart and strategic, our 2020 Events team can help you with any or all of your event and meeting needs. From the initial strategy, design and development of customized, comprehensive programs and events to the delivery of on-site staffing and event coordinators, 2020 Events helps clients achieve strategic goals, regardless of an event’s size or budget. 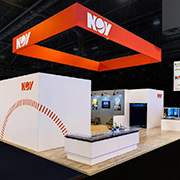 With a well designed, creative tradeshow strategy and presence, we help clients around the world reach key objectives, create lasting impressions and achieve top results. 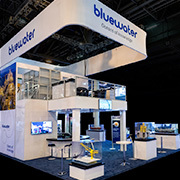 Maximizing our resources, we deliver creative, innovative and effective tradeshow experiences. Go Big or Go Home. Let 2020 Exhibits put our experience to work for you at CES 2019.